Forty years after the Nigerian Civil War ended and after so much had been said and written about the War by experts from various fields of endeavour, one of Nigeria’s master-storytellers, Onuora Nzekwu, who witnessed the war first-hand as a Biafran official, brings new life and gripping dimensions to the war narrative. His is a brilliantly narrated story, quite unlike anything before it. 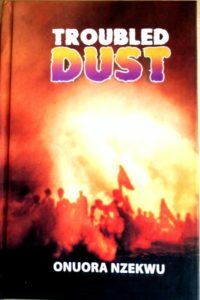 Troubled Dust is a historical novel of classical proportions; it encapsulates a dazzling model of storytelling, a subject of the magnitude of a grisly epic, an uncluttered language that is at once accessible as it is elitist, profound nuggets of imagination and critical engagements, and an overriding objectivity that situates the narrative above the leakages of mere sentiments. The beautiful manner of telling and the powerful imagery of war, distrust, fear, conflict, bloodshed, death, etc. – fill the plot with enormous suspense, and prod the reader to interrogate the nature of human existence. The book offers an overwhelming insight that stays on with the reader long after the reading.